People are always asking how to find Polaris, the North Star. It’s easy! Drawing a line through the two outer stars of the bowl of the Big Dipper faithfully points to Polaris. At one time, sailors’ livelihoods and survival depended on their lucky stars – most especially, the pointer stars of the Big Dipper. Scouts also learn to use the Big Dipper and Polaris to find the direction north. Polaris is not the brightest star in the sky, as is commonly believed. It is a moderately bright second-magnitude star, radiant enough to be easily seen – even on a moonlit night. Polaris is the most stable bright star in the northern sky. Unlike the other stars – which either rise in the east and set in the west, or else wheel in a circle around Polaris – the North Star appears fixed in the northern sky. If you stand facing Polaris, then, you are facing the direction north. If you place Polaris to your back, you are facing south. You can use Polaris to find directions only in the northern hemisphere, however. 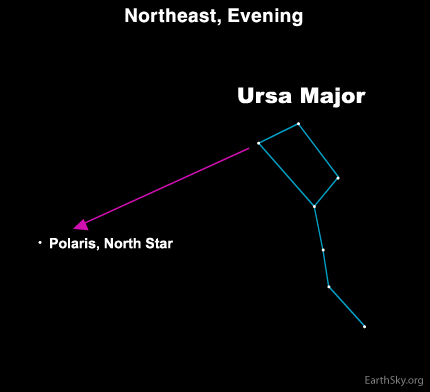 South of the equator, Polaris drops below the northern horizon. At this time of year, at nightfall and early evening, the seven stars of the Big Dipper will light up your northeastern sky. The Big Dipper is not a constellation, by the way. 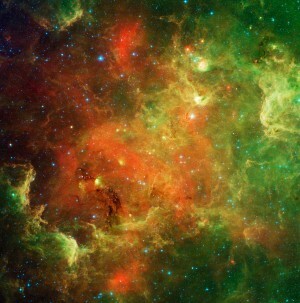 It is an asterism, or noticeable pattern of stars. Unlike many constellations, this famous asterism looks like its namesake. It is one of several dipper patterns on the sky’s dome. The Big Dipper is part of Urea Major or the Big Bear constellation. Some sources say the Dipper makes up the Bear’s tail and hindquarters. Many people say they cannot see the Bear, but I have imagined I have seen a bear in these stars, on very dark night around this time of year. To me, the Big Dipper looks like its part of the stomach of the Bear. Still, what I have pictured in my mind – and what the early stargazers believed they saw – can be different. The sky is, after all, a huge Rorschach test, with its starry patterns open to a multitude of interpretations. What do you see in and around the Dipper’s stars? One thing is certain. If you find the Big Dipper in the northeast on a March evening – and locate the two outermost stars in its bowl – those stars will point to Polaris! Give it a try. Site contents copyright © 2019 Recorder Online	except as noted. All rights reserved. | 88 queries in 2.349 seconds.